Folk Music from the Cajun Quarter of South London. This is the third, final and shortest draft of this review. The first two kept drifting into a musical history lesson; when all I really want to do is talk about the music on offer in this delightful package. History Lesson (abv.). 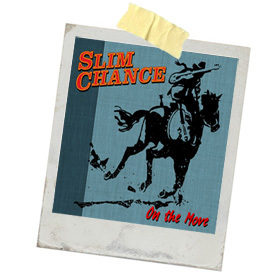 Slim Chance was originally formed by Ronnie Lane when he left the Faces and subsequently disbanded when he moved to the US of A, leaving everyone to pursue their own careers. After a handful of memorial gigs Charlie Hart and Steve Simpson decided on a whim in 2010 to ‘get the old band back together again’ and after trawling the lost and found columns; five original members and assorted friends put the show on the road in a quest to keep Plonk’s memory alive. Predominantly using the back-catalogue as the nucleus for a stage show the band have toured constantly ever since, even releasing two albums of those songs. But; with a band made up of accomplished songwriters in their own rite it was only a matter of time that a new album of predominantly self-penned songs would materialise; and here it is. On the Move opens with Steve Bingham’s road worn voice keeping the flame alive with the charming Fishing Line; that is certainly in keeping with my memory of the original band; luscious fiddles, softly swinging accordion and some classy acoustic guitar licks too. Fans of these guys will know that there’s another band that haunts their history; the near legendary Balham Alligators, and their spectre is all over Damned if You Do; with Charlie Hart’s smoky voice and the Spectoresque background harmonies made me smile like a ninnie! I didn’t recognise it but there’s even a Leadbelly song here, Duncan and Brady, with Steve Simpson and the band giving it a lovely Creole lilt, making it very danceable too. No disrespect at all to anyone in the band; but I’ve had a soft spot for Geraint Watkins for many years now; why he’s not Sir Geraint and living in a mansion in Mauritius; bought on his royalties I will never know; but the world can rejoice because he gets to take lead vocals on two songs here. Ragtime, is timeless and exactly what it says on the tin. Watkins gravelly voice is matched by his piano playing and Charlie Hart’s sweet fiddle while the band keeps time like a pendulum do. The other song; just may be my favourite here; Ain’t No Lady is pure Slim Chance; sounding quintessentially English at the same time as it can’t come from anywhere other than a Louisiana Honky-Tonk. Confused? You won’t be. The title of ‘favourite song’ was a tough battle because this version of the Balham Alligator’s Hey Hey, Ho Ho is charm personified in music, and the song that closes the album J’ai Besoin De Toi may not be what comes to mind when you think of Slim Chance; but it puts all of their ingredients into a pot and turns the heat up to 10 and comes out very tasty indeed. I’ve missed out a couple of songs; but that’s only because space is of the essence; but I can’t go without mentioning Bingham’s almost note for note rendition of Ronnie Lane’s hit single The Poacher. I dare you to listen to the album without checking to see where it comes and I swear you will go all misty eyed. Not only does Ronnie Lane’s memory shine brightly throughout On The Move; but the band have somehow managed to make their own album and a very good one at that. Ronnie Lane died in 1997 (was it really that long ago?? ).